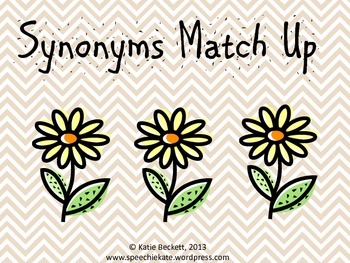 Have a student that is working on synonyms/antonyms? This would be a great product! You just cut and laminate the synonym cards, and voila! You can use to scaffold (give kids one card with three options for its synonym) OR use it as a memory game by placing them all face down and having kids find the matches. And I know that it’s completely free because… I made it! Language Question Prompts_Awesome!– I got this for free from Jessica Standford on pinterest— HERE is her link! I love this!!! I use it for pragmatics (story starters, convo starters), artic (phrase/sentence length), and for language, obviously. They are quick, easy and really useful. Found this bad boy on Pinterest! 🙂 Gah… I love Pinterest. Natalie’s TPT Shop – The dreaded idioms… so hard to explain these sometimes. Why do they say “It’s raining cats and dogs”? I have no idea! They just do. And it means raining hard. So there. Figurative language can be tough to teach! I got this activity from my SLP friend, Natalie Snyders…. Here is a link to her TPT page—this activity was FREE! Awesome resource, and there are more freebies and great products to purchase in her shop, too! Comprehension Strategies— I did NOT make these—this came from HERE. Check it out! A really cool set of posters for both SLPs and teachers! Hang up on the walls or copy, laminate and keep in a folder to pull out for tx as needed. Found this one on pinterest for free. Academic Vocab Word Sheet– I did NOT make this one either— I found this on pinterest for free. Love this when working on a direct vocab goal. Make a book of new vocab words you’ve learned. Bring home and show parents— practice word at home. Tons of applications for this one.